ESP with just a few of her purchases at River Garden Flower Farm stand, North end of the Union Sq. Greenmarket, New York City. Photo courtesy B.B. Platt. 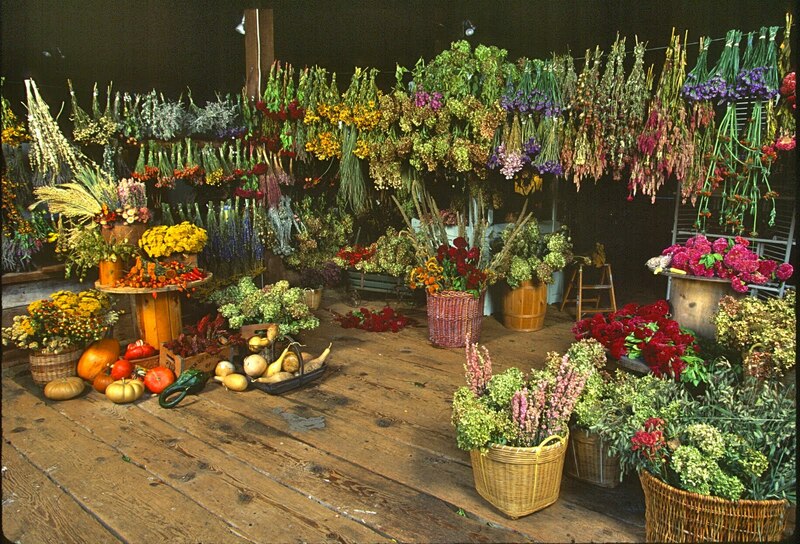 Not just drawn to the fruits and vegetables, I'm pulled as if by magnets to the flowers of the farmers market. fresh cuts, partly so I could bring them by armloads into my home. 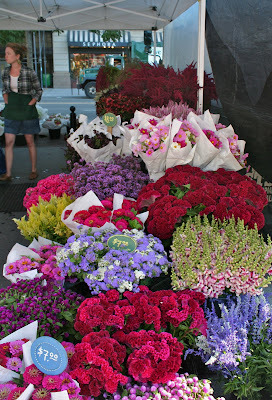 Now living in New York City I go to any greenmarket for my lilacs, peonies, sunflowers et al. 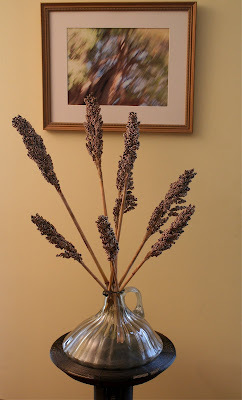 In fall when Other Ellen is busy preserving her fruit harvest, making wines and jams, I'm preserving flowers for the fall and winter seasons. At the River Garden stand on the last Sat. 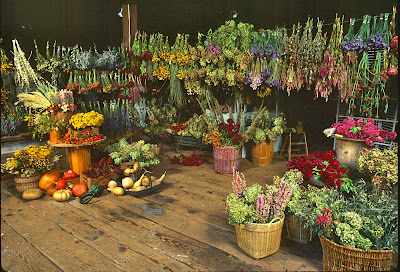 in August I had a choice of cockscomb in jewel box colors, globe amaranth, blue salvia, mixed grasses, ageratum, amaranthus, and double sunflowers. All I need is a place to hang them that is WARM DARK & DRY. 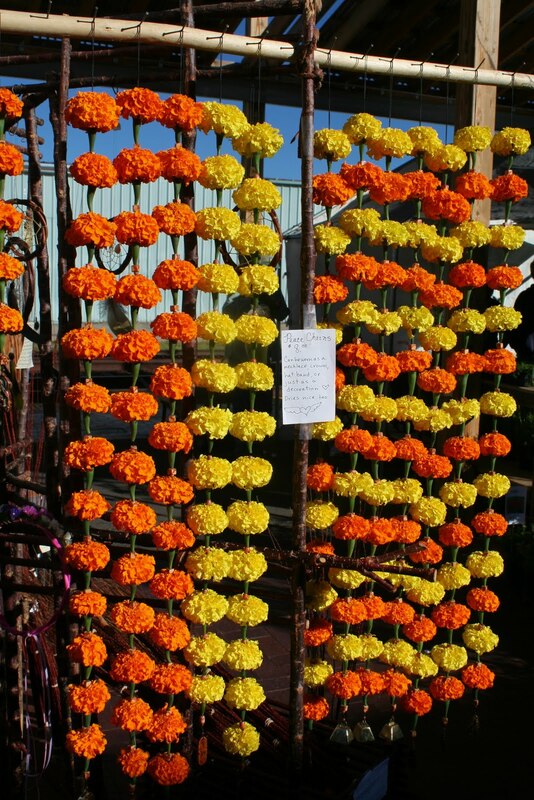 For everything you've ever wanted to know about drying flowers see my first book Flower Crafts. My favorite is a secret spot in my building that is locked and dark most of the time, and about 110 degrees. Fleshy flowers like cockscomb will dry in four days in that setting, smaller flowers even faster. Flowers shrink somewhat and lose the vividness of color as they dry but I know this and account for it by purchasing enough flowers to make a full arrangement and flowers that have a strong color to start with. Here are a few of the arrangements I made: Grasses, feather celosia with tansy picked wild from the back of Dave & Linda's house in MA. 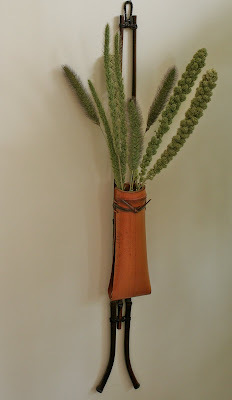 Grasses in a Japanese bamboo container hanging on my living room wall. 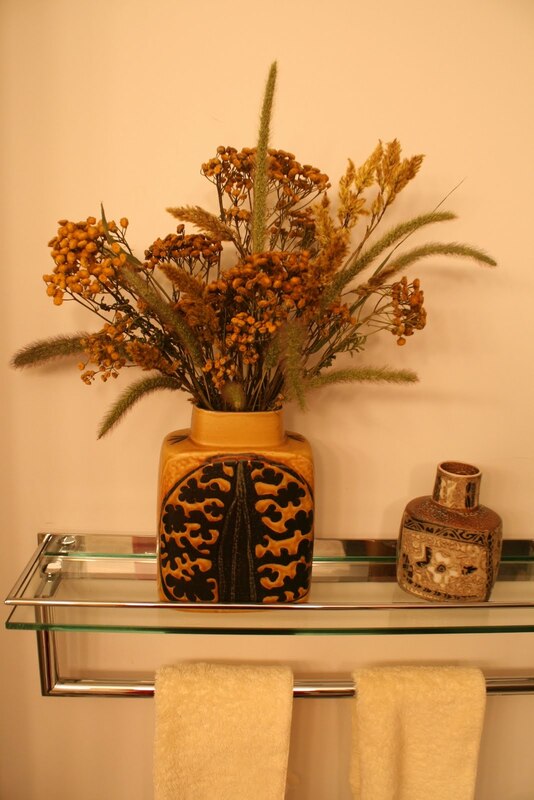 Cockscomb, tansy and grasses in the bathroom. Sorghum under a photo by Jen Platt Hopkins. 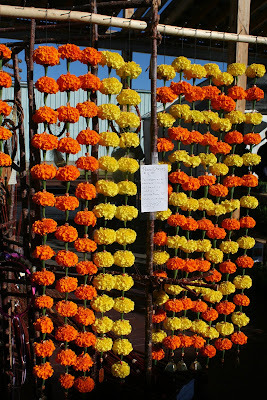 At the Santa Fe Farmers Market I was enchanted by these chains of double marigolds. Double click on the image to read the lovely sign. I love the Union Square Market. What a great way to preserve the flowers. A beautiful shot on a gloomy day.